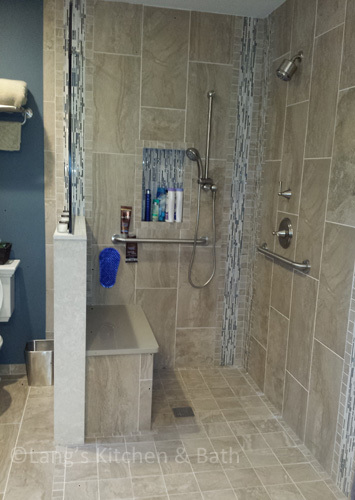 This bathroom design is defined not only by its sleek, transitional style, but also by the accessible nature of the design. The Dura Supreme hanging vanity cabinet in a dark wood finish beautifully complements the countertop and tile, with a mosaic tile accent in the shower. 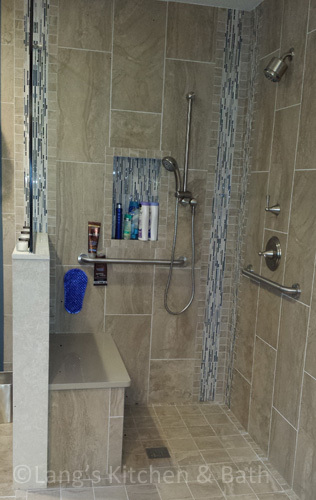 The open shower is fully accessible with a thresholdless shower base, grab bars, and a handy built in bench in the shower.